Toshodaiji Buddhist monastery in Nara was founded by the Chinese Buddhist monk Ganjin (Jianzhen) in 759. Ganjin was invited to Japan by the Japanese Emperor Shomu. 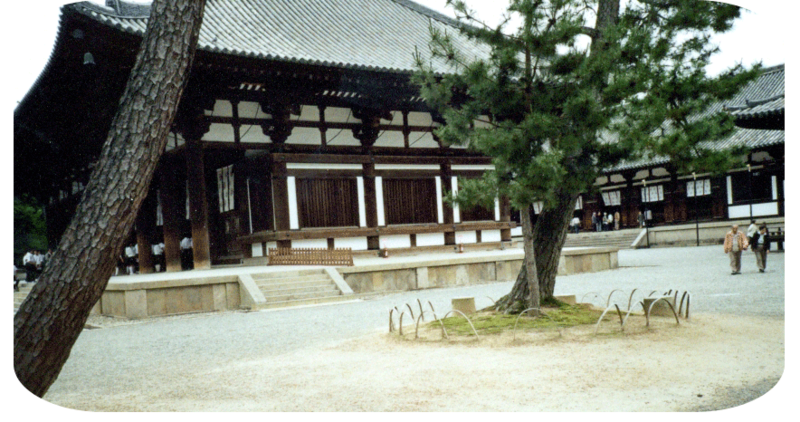 This picture taken by the Gardener in 2000 shows the main hall (Kondo) of Toshodaiji. The hall is under renovation from 2000 through 2009. However, the monastery is still open to visitors. The hollow dry lacquer statue of monk Ganjin (688-763) housed in Toshodaiji. Measuring 80 cm in height and sculptured around 763, this statue is made of layers of hemp cloth soaked with lacquer. The Gardener had the luck to view for the first time lotus plant and flowers in a lotus garden in Toshodaiji. 1. Lotuses and waterlilies are different plants. Although both are in the family Nymphaeaceae, the lotus belongs to the genus Nelumbo, while waterlilies belong to the genus Nymphaea. 2. The lotus is noted for its large flowers: some varieties have flowers with diameter up to 28 cm (11 inches). 3. Only two species exist in the world today. "Nelumbo nucifera, with pink or white flowers, is distributed in Asia and Oceania. . . . Nelumbo lutea, with yellow flowers, is distributed in [North and South America]." (Flowering Lotus of China, p. 6). Today in China there are over 200 cultivated varieties (cultivars) of lotus. 5. For the Chinese, lotus is viewable for its prettiness and edible in various ways. Lotus seeds, leaves and rhizomes are all food items. Lotus parts carry matrimonial and love connotations for the Chinese, although the lotus is also associated with Buddhism. 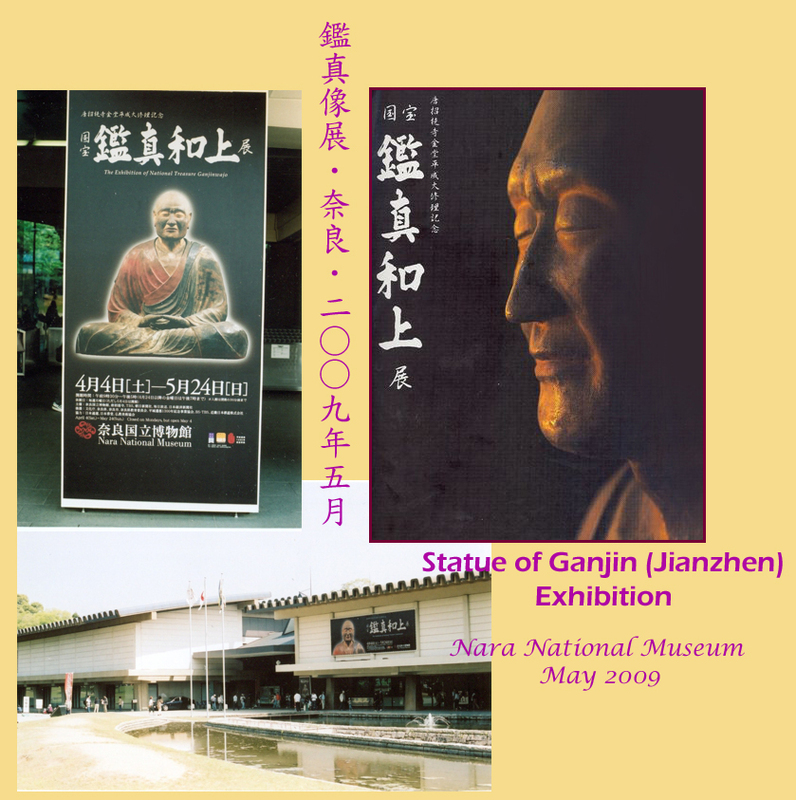 A commemorative book on the home-coming visit (exhibition) of the statue of Ganjin from Japan to China in 1980. Kokuhō no bi = National treasures of Japan 国宝の美. 01[sōkan 創刊] (May 2009). This inaugural issue is on the hollow dry lacquer statues of the 8th century, including an illustrated step-by-step description of the technique of making dry lacquer statues on p. 20-21. Moran, Sherwood F. "Ashura, a dry-lacquer statue of the Nara period." Artibus Asiae 27 (1964): 99-133. A detailed account of the hollow dry lacquer statue-making method. Wang Qichao and Zhang Xingyan 王其超 and 張行言. Zhongguo he hua pin zhong tu zhi 中國荷花品種圖誌. Taibei: Shu xing chu ban she, 1994. Zou Xiuwen, Zhao Xiaorui and Jin Xiaobai 邹秀文, 赵效锐 and 靳晓白. Zhongguo he hua = Flowering Lotus of China 中国荷花. Beijing: Jindun Publishing House, 1997.
pronounced as "han dan" in putonghua or Mandarin and as "haam daam" in Cantonese. 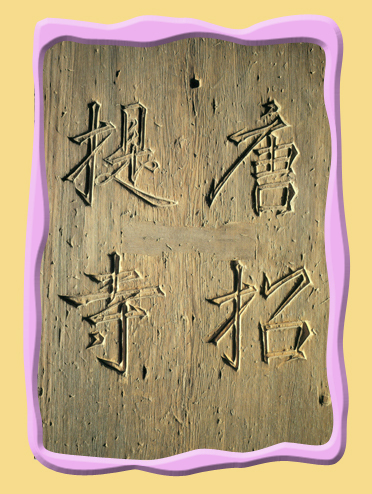 Name plate of Toshodaiji monastery. Calligraphy is probably by Emperor Koken of the 8th century.